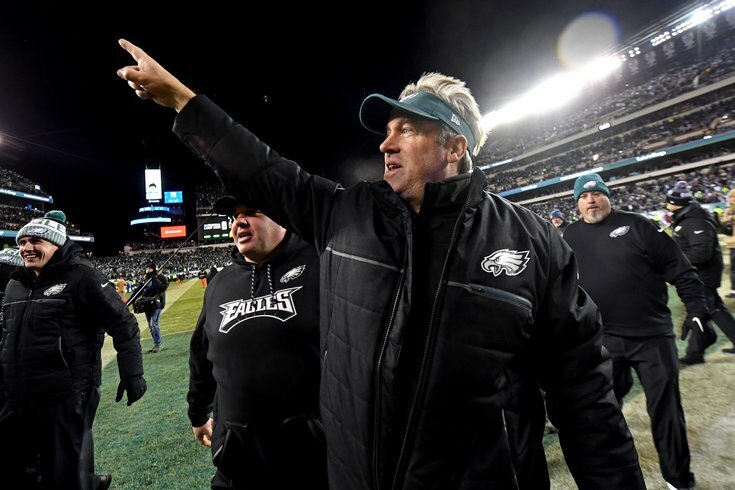 When the dust settled after the seven 2016 head coaching hires were complete, the Philadelphia Eagles' hiring of Doug Pederson was widely thought of as the worst of the group. Holy swing and a miss. From the failed annals of “don’t fire for the sake of firing,” we have the Philadelphia Eagles who, unhappy with all the power they bestowed upon Chip Kelly, were forced to fire a promising coach because, like a parent who gives a nine-year-old the keys to the car, then gets mad when the nine-year-old crashes, they couldn’t take back that power and just let Kelly what he does best. So what did Jeffrey Lurie have in mind when he sought out to find Kelly’s replacement? Well, he had to, uh, be a football coach. And knowing the game was a definite plus. And, I guess just wanting to come to Philadelphia to sign a contract was pretty much the main prerequisite. That’s how you end up with the blergh hire of Doug Pederson, who was coaching in high school just eight years ago (the Eagles love those quick-risers, don’t they) and served as offensive coordinator under Andy Reid for the past three seasons in Kansas City. And had never been interviewed by an NFL team. And was as nondescript as Kelly was high profile. Pederson might be perfectly fine, though I look at him and, I don’t know why, just see a younger Norv Turner. INSPIRING! Oh, Pederson, who didn’t call plays for Kansas City, was reportedly calling plays during the Chiefs’ Reid-esque drive against the Patriots — the one that seemed to defy all conventions of space and time and felt like it lasted as long as The Revenant. On Monday, the Titans' Mike Mularkey became the third head coach from the 2016 class to become unemployed, as he and the Titans "mutually agreed to part ways," per Field Yates of ESPN. Pederson led the 2017 Eagles to a 13-3 record despite the losses of Carson Wentz, Jason Peters, Jordan Hicks, and Darren Sproles. He should be (but probably won't be) NFL Coach of the Year.